As the original and time proven artificial grass solution for dogs, K9Grass® is the only true option for high-traffic dog areas. Our artificial turf for dogs uses safe, non-toxic, and premium materials that are extensively tested and suitable for any environment. You can install K9Grass in a variety of indoor and outdoor locations for both residential and commercial properties. In addition to our unique backing, K9Grass is strategically designed to eliminate infill, facilitating a cleaner environment for dogs. Debris including hair, feces, and urine are trapped in this material leaving no effective way of removing it. K9Grass is designed with AlphaSan® antimicrobial technology built into the blades to foster a cleaner, safer environment for dogs. In addition, the product’s no-infill design prevents dogs from digging up and chewing on bits of rubber. 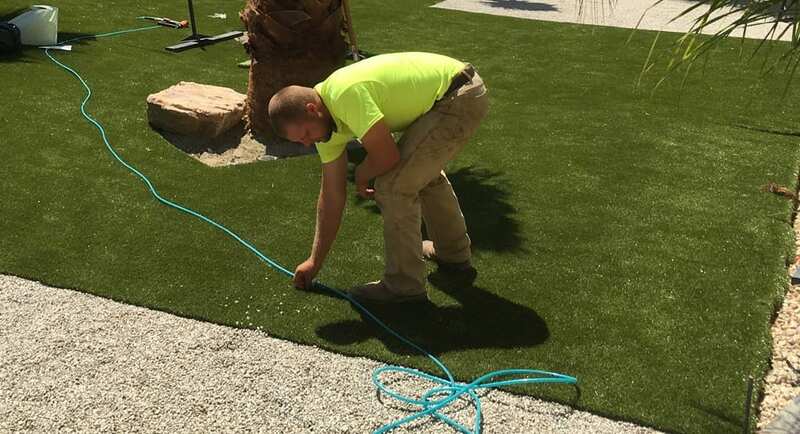 K9Grass is constructed with premium materials and installed using customized methods for long-term durability. K9Grass specialists will install your turf using the best determined method for your space, whether it be outdoors or indoors. Our new patented indoor flushing system was developed specifically for lasting durability in indoor installations. The knitted, flow-throughTM backing of K9Grass allows liquids to immediately leave the surface, making it easier to sanitize and rinse. Plus, the AlphaSan® antimicrobial technology that’s built into the blades deters the growth of harmful microbes and keeps the surface clean and safe for your dog. The turf’s dense blade construction causes solid waste to rest on top of the surface so it can be easily cleaned. You can choose from either K9Grass Classic or K9Grass Lite for your artificial grass installation. Like the original version, K9Grass Lite maintains the proprietary features of artificial grass for dogs, but simply offers a lighter-weight alternative. K9Grass Lite is ideal for applications where a less dense product is required, such as indoors or large pet areas. *Product heights shown may have a variance of 1/8” and product weights shown may have a variance of 2%. For the best synthetic grass for dogs, choose K9Grass. You’ll have a safer, cleaner-smelling environment for your dog with maximum drainage and durability. Check out K9Grass in action or contact us for a quote on your project.